What could be better than an inflatable that has all of your favorite Star Wars characters on it…one that could be used wet or dry! Imagine your little or big star wars fans enjoying year round regarless of the season! Choose your side Skywalker or Vader with this amazing licensed Star Wars combo unit. All of your favorites Princess Leia, Chewbacca, Han Sole, C-3PO, R2-D2, Yoda, Emperor Palpatine, Boba Fett even the Storm Troopers are featured on the front of the unit in vivid color along with a 3-D Millennium Flacon. 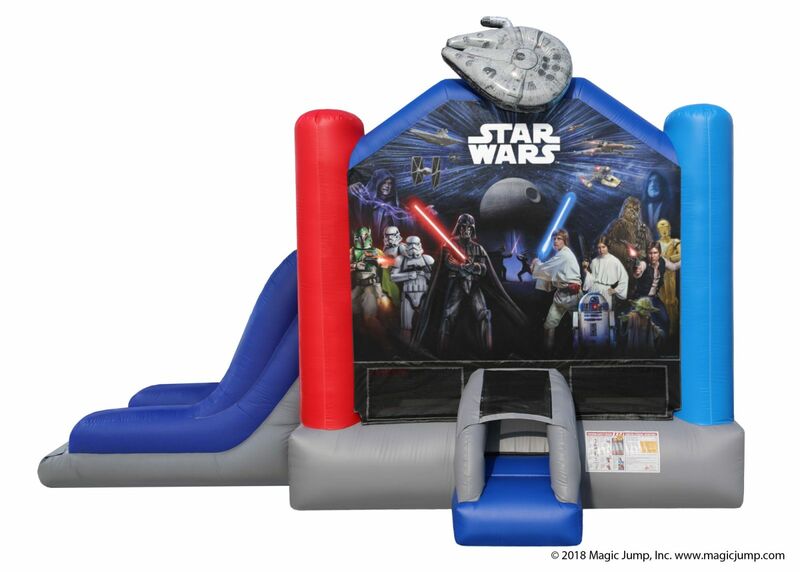 This fully licensed Star Wars themed combo is available to rent for your next party. Outlets: 1 Standard 8.8amps circuit 110 volt GFCI outlet within 100 feet of the unit. Generator Rentals are available.